Are you shopping for a versatile yet fun to drive pickup truck around Winston-Salem, North Carolina? Toyota's Tacoma trucks have always provided a high level of versatility, due to their fuel-efficient yet potent powertrains, multiple cab styles, high ground clearance and affordable prices. The recently redesigned Toyota Tacoma provides all of that and more, thanks to its well-appointed cabin, now offering the latest technology and convenience features from Toyota. Pickup truck shoppers near Winston-Salem and Greensboro, NC can shop for a new Tacoma at Vann York Toyota in High Point. Our entire inventory of new Toyota vehicles is available to be viewed here on our website, including the versatile and off-road ready new Tacoma. Browse our new Toyota Tacoma inventory now to find a 2016 or 2017 Tacoma pickup to call your own. If you are looking for a late-model used Tacoma, we have those in stock, too! Our modern Toyota dealership is state-of-the-art and is designed to provide you with the high level of service, parts and sales assistance that you deserve. Your Toyota needs are our top priority so don't hesitate to reach out to us today! Toyota's latest Tacoma pickup trucks are offered in a range of nicely equipped models, including the SR, SR5, TRD Sport, TRD Off-Road and Limited. The Tacoma SR base model features an impressive list of standard amenities, including Toyota's Entune Audio, Bluetooth wireless technology and power windows and door locks, plus a GoPro mount for catching all of the action. 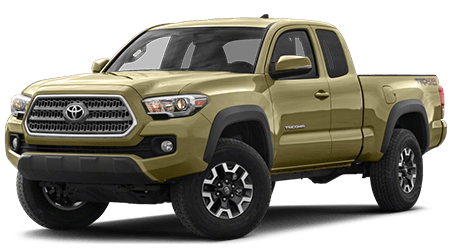 For the ultimate expression of Tacoma off-road performance and capability, drive the Tacoma TRD Off-Road model, equipped with an electronic locking and limited-slip rear differential, Multi-terrain Select, Crawl Control, and stylish 16-inch alloy wheels. Toyota's 2.7-liter, 4-cylinder engine comes standard on 2017 and 2016 Tacoma pickups and generates a highly capable 159 hp and 180 lb-ft of torque. You can have your Tacoma with one of two new and improved 6-speed transmissions: a silky smooth automatic or sporty manual gearbox. Both transmissions have been revised to improve fuel economy and performance. Toyota's powerful, workhorse 3.5-liter V6 is also available and delivers a whopping 278 hp and 265 lb-ft of torque to the rear wheels, or, all four wheels via an all-wheel drive (AWD) system. Start shopping Vann York Toyota's online inventory now to find your new Tacoma pickup truck at a low price! You can see our low prices on every new vehicle in our inventory, get pre-approved for an auto loan and even value your trade-in vehicle while you shop here on our website. Visit our Toyota dealership at 500 Eastchester Dr, in High Point, NC to test drive a sporty Tacoma pickup truck. We proudly serve drivers near Winston-Salem and Greensboro, NC.